Nostalgic trip down memory lane – even for kids just born this morning. Great photos of posters, trademarks, labels, ads, & more. Like Thompson Candy’s pack of Camels called Humps chocolate “cigarettes”. And the plastic space-robot Clanky Chocolate Syrup. Or a GI, with his idealized date sitting next to him, ready to lay the kiss on with a box of Whitman’s Sampler. Kimmerle has assmebled a stellar collection that makes Warhol spin, swell & dance with pride in his grave because she’s as much a curator as an author. Her sweet candymonium has the feel of a museum exhibit or documentary film, complete with color-coded, pictorial timeline history. 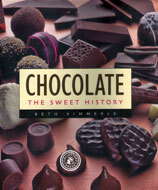 The book encompasses the typical where-chocolate-comes-from, how-it’s-made, recipes, & so on, but also enshrines the everlasting (& not-so-everlasting) names of chocolate heroes in a virtual hall of fame, including the usual suspects (Nestlé’s, Hershey’s, Ghirardelli, et. al. ), as well as the long forgotten (Elmer’s Candy Corp). If M.O.M.A. in NYC can exhibit a whole floor of modern artifacts that my Mom stashed in the attic before tossing out with the trash, then Chocolate: The Sweet History at least deserves space on my bookshelf. That’s if I had one… Mom threw that in the garbage too.